The Story of us. How did we come to be? Raghu, Sanjay & Srini (the founders) are close friends for the past 2 decades and have 65 years of work experience collectively. They have performed various roles in previous organizations like: Sales, Professional services, Research & Development, Operations and Delivery, Accounting and business finance, Compliance and corporate governance. It was long evident that the founding team had the “entrepreneur itch”, as they would often indulge in consulting and advising other start-ups. With many relationships and connections in the industry that the founders had invested in and nurtured over time; and a compelling story behind what they had to sell, the founders were certain that their acquittances will be interested to hear them out. This truly was the genesis for the business idea that is today Hexaform Technologies. The choice of the business idea not only had to play to the founding team’s strengths but also needed to be an area that businesses were going to invest in the near future. IT infrastructure transformation specifically niche technologies like Hyper Converged Infrastructure, SDDC, SD-WAN, etc, was going to be the growth enabling platforms for the future, and hence became the choice area for Hexaform. The team then sat down together over the next few months to repeatedly refined the pitch, narrow the focus on target customer segments, chose offerings and reworked the entire model until they jointly felt the plan was executable and the financing required also made viable. Finally on 6th of November 2017 Hexaform Technologies Pvt. Ltd was launched. “Hexa” represents machine language and “Form” is short for transformation. Hence the name “Hexaform” and our motto is: “Intelligent Machine Transformation”. We started off by taking a few seats in a small co-working office in south Bangalore. By the start of FY 18 we needed a much larger space where our staff could collaborate freely. By October 2018 we moved into our private facility in JP Nagar, south Bangalore that can seat upto 60 staff. What are the challenges pertaining to IT Infrastructure in the industry now? How is Hexaform addressing them to stay ahead of the competition? Enterprise strategies related to IT Infrastructure are generally reactive in nature. Companies both large and small are now building their businesses and applications on next-gen technologies like AI, ML, IoT, Big Data, etc. However, their planning rarely considers the impact these technologies bring to their core IT infrastructure. The result is a reactive piece-meal approach of adding a server here and an appliance there to accommodate the need of the hour. Hexaform’s Comprehensive Platform Advisory Review aims at resolving that dilemma. C-PAR considers the customer’s business initiatives, capacity usage expectations, existing limitations and cost considerations; and builds a next-gen IT infrastructure platform that is optimized for what they have today and will need to cater for what is to come tomorrow. The C-PAR framework comes with no-strings-attached, however, once the customer undertakes the C-PAR journey, they realize Hexaform’s offerings are second to none. The Go-To-Market plan that started us off, what we did differently. Once the customer outreach started, the team quickly realized that the ‘Blue Ocean’ of opportunities were with Small & Medium Businesses. However, the challenge was how does one define the ‘SMB’ segment. The most common reply is that the segmentation is done on revenue. Hexaform took a different approach. Simply put, definition of small and medium business is not the money they make, rather how much of IT infrastructure they consume. For Hexaform, anyone consuming under 50 bare-metal servers or 250 virtual machines is a SMB customer. These customers want to move to the new-age applications talked about earlier, but are limited by their current infrastructure. When a sample of these customers experienced our C-PAR program and its outcome, the response was overwhelmingly positive. They liked the solutions proposed and now are at various stages of IT infrastructure transformation projects with some of these customers. Driven by the mission to help enterprises to transform and migrate their legacy IT infrastructure into a virtual, cloud-ready and next-gen platform, what are the unique services & solutions that you provide to your clients? Before embarking on entrepreneurial journey the founding team did extensive market research on areas that is likely to define the future of IT infrastructure. Hexaform’s workforce strategy (right from hiring, training to work delivery) centres around achieving mastery in these six areas. Hexaform is well on its way to achieving skills, certifications and overall expertise in these areas. Also, at the heart of everything that Hexaform does lies C-PAR. This framework has been built to work best with these specializations. Hexaform strategic partnership ecosystem. Who they are and why. Hexaform is an end-to-end turnkey IT infrastructure solutions integrator. Our Solution offering is bucketed in 6 silos. All of our partnerships with OEMs are strategic and provide us complete IT infrastructure coverage. VMware, with its industry leading HCI and SDDC solutions, is our primary partner. Hexaform is an Enterprise-tiered partner with VMware, and we have heavily invested in skills and people with VMware in mind. Hexaform has already ticked off many solution competencies in VMware and are well on our way to become one of the first few partners in India with a Master Services Competency tag from VMware. Extreme Networks with its innovative Next-gen networking solutions in the datacentre, fabric and campus makes them our invaluable primary networking partner. Dell, with its strategic relationship with VMware, becomes a natural fit in our bouquet of solutions. HPE’s servers and storage solutions provide us edge in datacentre projects, and HPE-Aruba’s wireless portfolio is a game-changer. Finally offerings from Amazon Web Services and NTT NetMagic encapsulates our public cloud and hybrid co-location solution strategy very nicely. Explain more about C-PAR. Why is this an USP of Hexaform? The Comprehensive Platform Advisory Review in-essence is nothing but a philosophy and approach towards solving a problem. Using the expertise and experience on working in IT infrastructure transformation projects, our experienced staff have built a methodology of collecting information, digesting and then building best-fit solutions to address the business problems. Hexaform has templatized the process to document and report both the findings from the audit and recommendations towards a next-gen solution. While, C-PAR can be used for generic IT infrastructure projects, this framework has been fine-tuned and chiselled to perfection for our 6 areas of specialization. C-PAR is made of 3 stages or phases: Consult, Construct, Convey. In the Consult phase our technology consultant sits with key stakeholders and decision makers of our customers to understand their business imperatives that drive IT, long-term vision of where they see their IT infrastructure developing into, capacity usage expectations, consolidations along with other cost-optimization initiatives, factors in IT infrastructure preventing their business growth, etc. In the Construct phase the technology consultant audits and collects the current physical and virtual infrastructure inventory, rack layouts, application & other component’s inter connectivity. Now, keeping the ‘thought triggers’ (aka – the business drivers) as the end-goal and keeping the current infrastructure as the baseline we go about using our ready to consume solution templates and build a proposed solution. Finally in the Convey phase, our technology Consultants sit with the stakeholders and explain in great detail the solution we built covering aspects of like, Total Cost of Ownership, ROI, Cost Benefit analysis and close it off with a State-of-the-art migration plan. All of the takeaway material is documented in easily consumable packages that the customer can use further for their decision making. What’s next? What is the growth plan for Hexaform? What can the industry expect from us? On business front, Hexaform has now established a base of operations in Bangalore from where it can service south India. Next on the agenda is to establish a center of excellence in the west region. The choice of city will be made based on opportunity, cost and availability of resources. Finally, towards late 2019 there are plans to open offices in the middle-east to establish and grow in the MEA region. Hexaform’s strategic milestone, called ‘Mission 50-50’, is on target to be achieved by end of FY 20. Mission 50-50 stands for achieving an annual revenue of 50 % growth YoY and hitting an employee strength of 50. 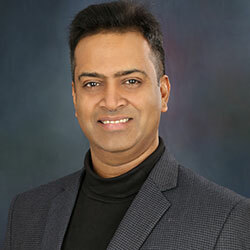 Sri Raghunath is an IT industry veteran with over 2 decades of experience with a career spanning from being a mainframe developer to being Sales Director for next gen contact center solutions and products. Raghu is an alumni of R.V College of Engineering. After a 4 year stint in Japan, he spent the next decade and a half at Avaya, Aspect, and Nice. Here he donned various caps as he performed roles in R&D, Services, and Sales. Sales and Customer management are both his strength and his passion. Before co-founding Hexaform Technologies, he consulted with other start-ups helping them in strategy, sales and funding. 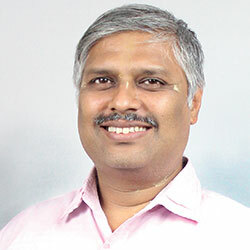 Sanjay Kumar Pathi, a strong delivery leader with over 20 years of services delivery expertise. Sanjay is an alumni of R.V College of Engineering. 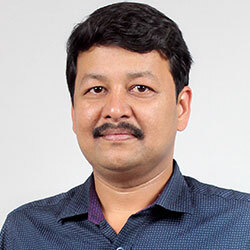 Sanjay started his career as a programmer and progressed to various roles of project management, Centre of Excellence Head, customer relationship management and so on. Sanjay spent close to 19 years of his career working for HCL Technologies in various project and delivery management roles. During his stay @ HCL, he was part of many key accounts in EU and US regions. He has had stints in Switzerland, UK and US during his career in various capacities. He led and successfully delivered many Data Center migration projects in the UK and other EU countries. Sriniketan has over 18 years of expertise in accounting, business finance, and corporate governance. He has held the key finance positions with Innoviti, Zeiss, Tyco / Pentair & Volvo. He has also consulted for many firms on financial matters ranging from company formation all the way to Series-A, B funding. With his expertise in Company legalities, Tax and Internal control Srini forms an integral cog in the company's machinery.